I should have posted about this earlier, but recent events have made the last few weeks a little hectic. This Saturday 16 February an event called "A Night for the Crocs" is being held at Zoo Miami in Florida. 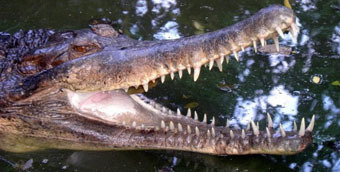 There are all kinds of activities for kids and adults alike, and best of all the proceeds for the event will be used by the Tomistoma Task Force of the IUCN Crocodile Specialist Group for direct action to conserve the endangered Tomistoma (false gharial) and its peat swamp forest habitats in Malaysia and Indonesia. I won't duplicate any more information from their website, so go and check it out here. Sounds like a lot of fun for a good cause, and you can't argue with that!